These fish can be aggressive and will eat inverts around the tank, for that reason this fish is best kept in a fish-only with live rock but not corals set up. Keep only with similar sized robust tank mates, smaller fish may be eaten and shy fish may be bullied. 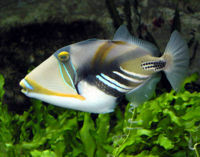 A medium-range aggressive and territorial Triggerfish. Some have said it peaceful, and amicable, while others claim it's aggressive and territorial. While definitely not as aggressive as the Undulated Triggerfish, or the Queen Triggerfish, it is most definitely more aggressive than, for example a Crosshatch Triggerfish or a Sargassum Triggerfish. This page was last edited on 8 March 2018, at 00:41.